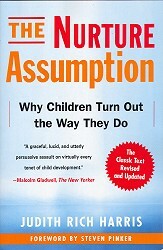 "The Nurture Assumption changed the way I thought about the world." in the evolution of human hairlessness and skin color. A Gene-Environment Interaction in Antisocial Behavior? 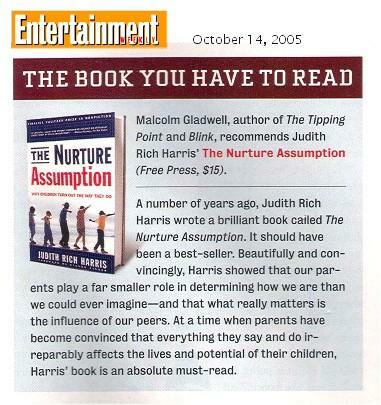 "Independent scholar Judith Rich Harris . . . put forth a provocative hypothesis, based on behavioral genetic studies, that parents do not mold their children beyond the parental genetic contribution. 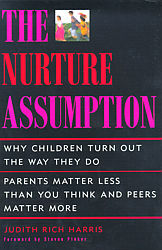 The big socializers of children, she argued in The Nurture Assumption, are their peers. . . . Whatever the initial resistance to their ideas, individuals like Albert Einstein or Charles Darwin, Carol Gilligan or Judith Rich Harris, Marcel Proust or Martha Graham, come to exert an influence on a wide audience. Their names become known, their ideas spread, with or without public awareness of the identity of their creators." --Howard Gardner in Changing Minds, March 2004.
or individual newspaper web sites, or through EBSCO and other databases at your local library. 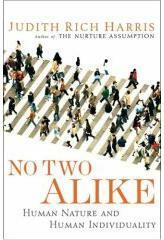 many more reviews . . . . . .
TO UNDERSTANDING discussion in book by Lilienfeld at al. 10/09 50 GREAT MYTHS OF POPULAR PSYCHOLOGY chapter in book by Lilienfeld at al. 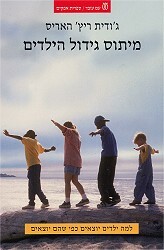 4/05 DEVELOPMENT OF THE PERSON discussion in book by Sroufe et al. 2/04 JOURNAL OF ABNORMAL PSYCHOLOGY discussion in article by Jaffee, Caspi et al. SOCIAL INTERACTION SKILLS chapter by Hart et al. 1/03 J. of PERS. & SOCIAL PSYCHOLOGY discussion in article by Herrera et al. 10/02 HOW FAMILIES STILL MATTER discussion in book by Bengtson et al. 1/02 HUMAN EVOLUTIONARY PSYCHOLOGY discussion in book by Barrett et al. 4/01 CANADIAN JOURNAL OF PSYCHIATRY discussion in article by Plomin et al. 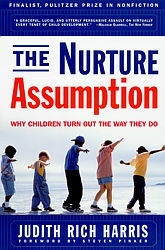 2/01 AMERICAN PSYCHOLOGIST "The Nurture Assumption Persists"
11/00 BEHAVIORAL GENETICS discussion in book by Plomin et al. Spring/00 BELIN-BLANK CENTER for GIFTED EDUC. 2/00 AMERICAN PSYCHOLOGIST discussion in paper by Collins et al. 12/12/98 THE ECONOMIST a 1998 "very, very best book"
many more articles, books & columns . . . . . .
2/15/99 BBC RADIO 4 / ANALYSIS Harris, Kagan et al. 5/30/02 CTR. FOR BARNDOMS- OG FAMILIEFORSK. links to TNA site etc. Spring/01 UNIVERSITY OF VIRGINIA cultural psych course required reading: Psych. Rev. 1/1/99 RAISIN one of "10 Biggest Influences on Parenting in 1998"
many more online items . . . . . .
10/28-11/10/98 SLATE: The Fray: R.I.P. Nature or Nurture? Please report broken or incorrect links, and items that should be added to the lists. Use quotation marks to find a phrase: "peer group". Otherwise all items that contain either term will be found: peer or group. Note: This search will find only words on other pages of this site, or words in full-text articles on this site. It will not find words contained within most of the items for which there are links.